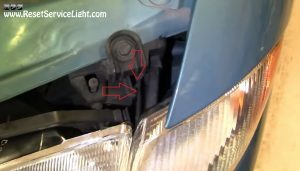 Do it yourself, change the parking light assembly on your Dodge Intrepid, the model manufactured between the years 1993 and 1997. This is a very simple replacement that can be done in less than 5 minutes and there are no tools required to do it. First of all, you must open the hood of the car, in order to access the parking light assembly. Now, if you plan to remove and replace both the headlight and the parking light assemblies, you must remove the headlight first and the parking light will come out a lot easier. If not, you have to insert your finger between the assemblies, reach the clip shown in the image below, push it and at the same time, pull out the parking light. It may be quite difficult in some cases, but after you detach it, the last step will be to disconnect its electrical harness and bulb, by twisting them counterclockwise (see picture below). This should be the moment when you can install the replacement and this should be an easy task. Reconnect the bulb and insert the assembly into its place, with the exterior side first, where you have a guiding pin and then just snap the assembly into its retaining clip. 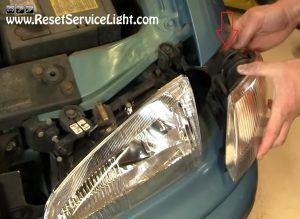 These are the steps you need to follow, if you wish to remove and replace the parking light assembly on your Dodge Intrepid, the car produced between the years 1993 and 1997.